Writers in Residence: a T. O. S. Review | My Journeys Through Life . . . Herding Cats In New Mexico! For several weeks now, we have been checking out another resource from Apologia Educational Ministries. 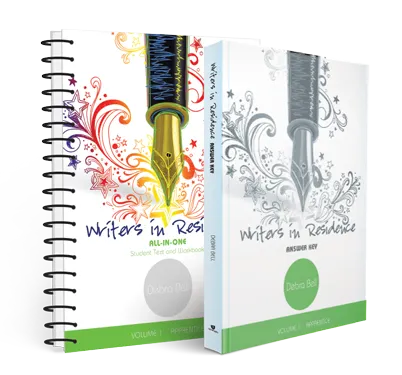 This product is called Writers in Residence, and it is a very good, full language arts program, designed to be used over one year. I must tell you, first and foremost, how overwhelmed I was when I opened the box! Even after reading about this program, I truly did not expect such a BIG Student Text and Workbook! It is an all-in-one book, and this program, Volume 1 Apprentice was written by Debra Bell. And when I say it is big, I am NOT kidding, because it comes in at 575 pages! There is also a thinner (thank goodness!) answer key for the parent or teacher. At first, when I saw that the first 30 or so pages were just for me to read, in order to learn how the Student Text and Workbook is to be used, I got a little panicky. I REALLY like for things to be kind of “open and go”, much like the “plug and play” games my kids used to have for the TV. However, once past those 30 pages, depending upon your student, it did end up to be sort of a “let him go to it on his own” sort of thing. There are suggested daily schedules in which he can check off his own boxes as he goes, for example. Throughout the Student Text and Workbook, there are spotlights on Christian writers. These are very complete interviews with a variety of authors. I had never heard of any of them until now, but have become interested in looking for and reading their works. This review did hit home with me in that we have never done “formal” grammar lessons, however, to be honest, it does not change my feeling that the way we have taught them, by example and with verbal correction has worked for our family. I do think that this is a very good writing curriculum however. “The Artist” really enjoys writing stories, and so he was definitely interested in this review. He is always (like every day, in fact!) asking if he can go on the computer to write on one of his stories. He generally has more than one going at a time, sort of like me when it comes to reading books, lol! I do like that you are encouraged not to force perfection on your child, but rather to reward their effort instead of marking it “wrong.” In my opinion, this helps the child to keep going, and wanting to succeed. I believe though, that we will take more than one year on this one; simply so that one, we can be thorough, and two, we can work at “The Artist’s” own pace. 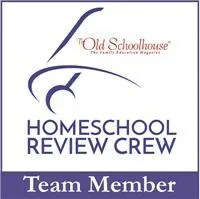 To read what other crew reviewers think about Writers in Residence from Apologia Educational Ministries, please go here.